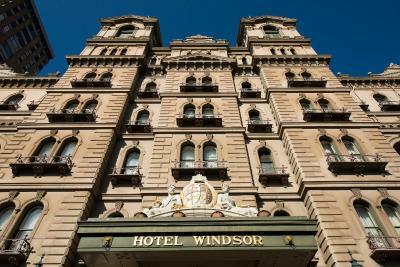 Lock in a great price for The Hotel Windsor – rated 8.8 by recent guests! 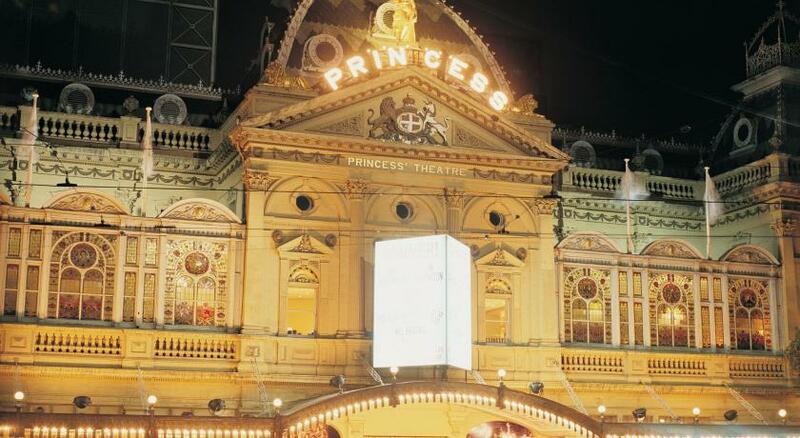 Brilliant location, so close to the Princess Theatre and train station. They kindly upgraded us as it was a special occasion. Everything...the location...that it was a beautiful historic building...clean...kind efficient staff and lovely room. Fantastic location. Big room. excellent concoerge Ben. He set up multiple events for us all to our specifications. It is a 100+ year old gem of a hotel. 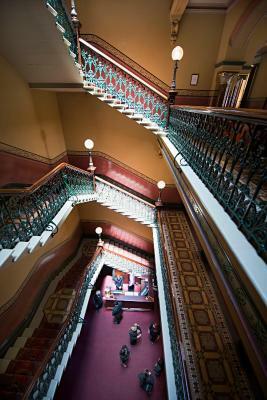 Gorgeous staircase and afternoon high tea. The staff was excellent. Great location, trams right outside the door. Grand facility built in 1883, has all modern conviences in the room. Concierges were all super helpful and friendly. The staff were all excellent; friendly and helpful. The decor in the room had a timeless elegance that inspired a feeling of relaxation! Beds were very comfortable and extra blankets were supplied on request. The buffet breakfast was delicious; a great way to start the day.The maitre d' was very welcoming. 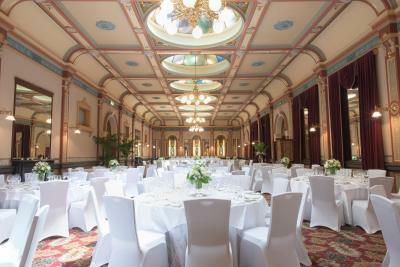 We love the old world atmosphere of the Windsor, all the history, the beautiful architecture, especially the ballroom where our function was held. The staff are very friendly and helpful, we loved the breakfast with the beautiful crockery and yummy food. Our room was standard size but the bed was comfortable and the atmosphere was warm and cosy. Breakfast in the grand dining room was delicious. There was a range of cooked food to choose from fried tomatoes to bacon and delicious scrambled eggs. There was ample pastries and bread and fruit to please all tastes. The staff always kept my coffee cup full. Very comfortable stay in grand old hotel. Splashed out on room service which was delicious. Staff are all fantastic, excellent service with impeccable manner. Beds great, bathroom clean and dressing room was useful, Deluxe room size was huge. If you want mod-cons this isn’t the hotel for you but I love the old world charm! The buffet breakfast excellent and the staff. Very comfortable bed and shower pressure and temperature always good. The Hotel Windsor This rating is a reflection of how the property compares to the industry standard when it comes to price, facilities and services available. It's based on a self-evaluation by the property. Use this rating to help choose your stay! 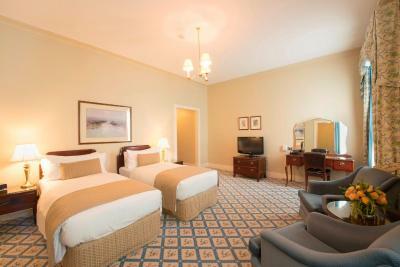 Established in 1883, this historic hotel combines classic style with modern facilities. Located next door to the Princess Theater, The Hotel Windsor offers luxury accommodations in the heart of Melbourne. Guests enjoy free WiFi. 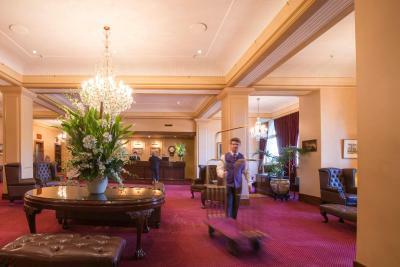 Located in Melbourne CBD, The Hotel Windsor Melbourne is only 5 minutes’ walk from the shopping and dining on Collins Street and Bourke Street. 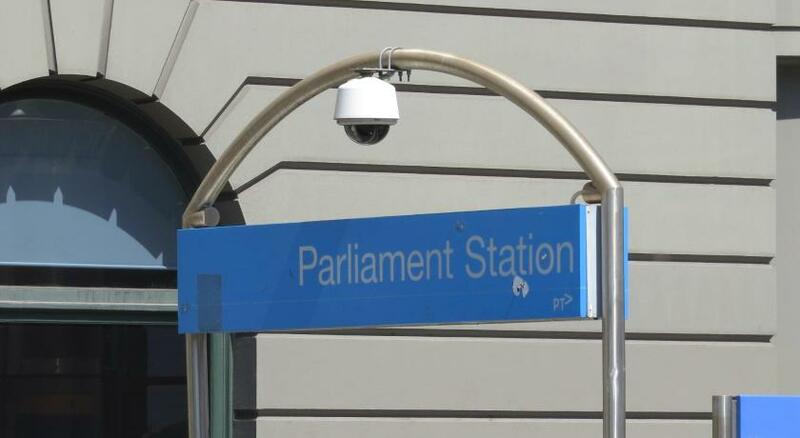 It is located next to Parliament Train Station and trams stop in front of the hotel. Each spacious room includes cable TV and high-speed internet access. Luxury bathrobes and a fully stocked mini-bar are also provided. Guests can choose their own pillow from the pillow menu. 24-hour room service is available. Breakfast is served in the hotel's restaurant. 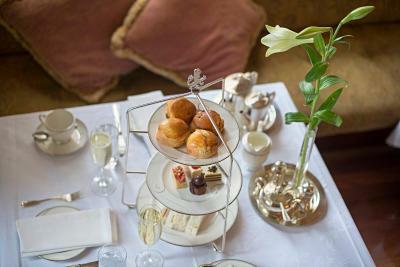 111 Spring Street Restaurant offers elegant innovative cuisine and traditional afternoon tea. The Cricketers Bar serves a range of drinks and light meals. 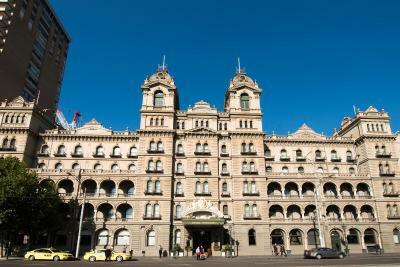 The Hotel Windsor is a Melbourne landmark, featuring traditional 19th-century décor and 12-foot-high ceilings. 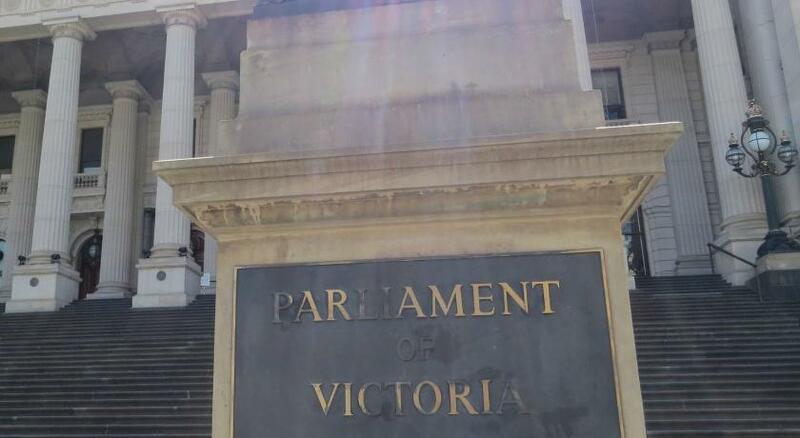 It is located opposite State Parliament House and Treasury Gardens. When would you like to stay at The Hotel Windsor? This room features a queens-size bed and a marble bathroom with a shower and a bath. Please note this room has no views. 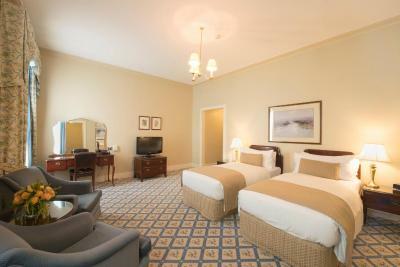 This spacious room features a king-sized bed or 2 single-sized beds, a marble bathroom, walk-in wardrobes and armchairs. 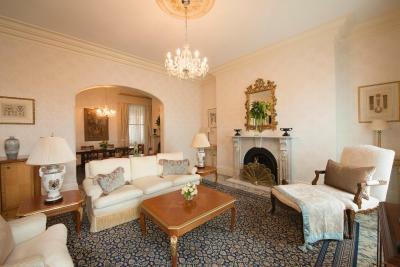 This luxury room features high ceilings, a marble bathroom, lounge and a walk-in-wardrobe. 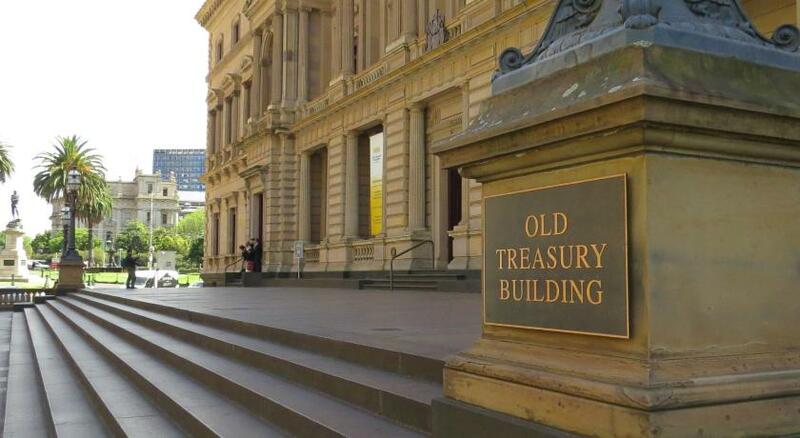 This suite features uninterrupted views of Melbourne's Parliament House. 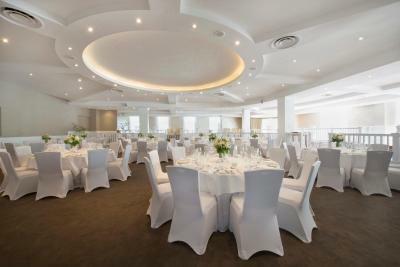 It also includes 2 large rooms with a dining area, oval-shaped windows and a butlers servery. A large king bedroom, walk-in wardrobe and a marble bathroom are provided. Please note all Windsor Suites can interconnect with a Superior Room to make a 2 bedroom, 2 bathroom suite, for an additional charge. If you would like interconnected rooms, please use the special request when booking or contact the property using the contact details found on the booking confirmation. 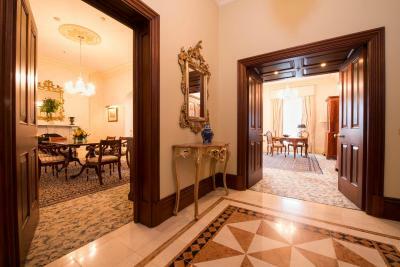 This unique room features a separate dining area, tall windows and stunning views of Parliament House and the Treasury Gardens. This suite features a lounge and a separate bedroom with a king-sized bed. It also includes a large LCD TV and armchairs. House Rules The Hotel Windsor takes special requests – add in the next step! 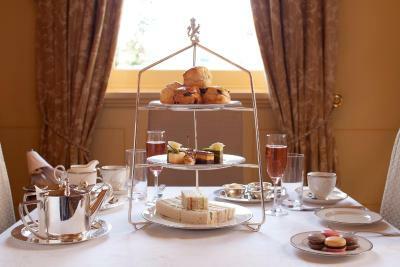 The Hotel Windsor accepts these cards and reserves the right to temporarily hold an amount prior to arrival. Please note that there is a 3.35% charge when you pay with an AMerican Express, Diners Club or JCB credit card. We only wish our room had a better view! And give the food at the Cricketer's Arm, the pub downstairs, a miss! The elegant and historical decor from a bygone era! The very convenient location. The beautiful 2 course breakfasts. The courteous and helpful staff. A very restful and comfortable night's sleep! I can’t find anything wrong with it. All is good. Excellent location - close to transport, restaurants. Breakfast was the choice of a la carts or buffet style. Either option looked beautiful and bountiful. The Windsor is in an excellent location, close to China town and some wonderful theatres if you want to see a show. It is also across the road from parkland if you want to get out for a quick walk. The hotel itself is an architectural delight with its history beautifully preserved. Friendly and Welcoming Staff. Charming atmosphere and clean room. Comfortable bed / pillows. Good Breakfast and dining options also available on site or close by. Close proximity to East Melbourne. Tram Stop / incl: Free City Circle Tram at front door. Highly recommend, value for money. Quieter area of city as no rail tunnel building works near east side of CBD. The hotel had a great charm and atmosphere. It’s yesteryear feel brought a calm warmth to a central city location. The hot water took a long time to kick in. The old world charm. The comfy bed and pillows. Our room was a bit noisy. The room above had their tv blaring and made it hard to sleep.